The photo id for this photograph is 121, in the People album. 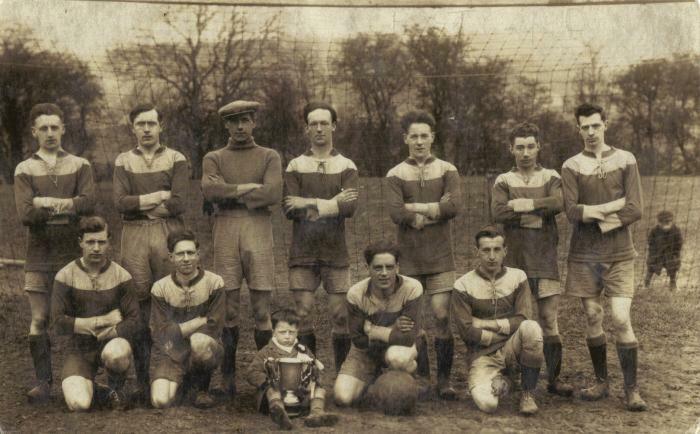 The man on the front row with his knee resting on the football is Jack Winterbottom who was from Barren Clough, Bugsworth but spent his married life in Whaley Bridge - mainly in Macclesfield Road. His brothers Fred and Bill also played football in local teams. This would appear to be the same team as in picture 118. Forgot to say on my previous post that my Dad (Bill Jones) always said he was the little boy peeping through the net on the right-hand side !